A.O.Y 4 Sides 66LED Outdoor Solar Lights 3 Modes Wireless… | FreebieOrBust Freebies! We have the most outstanding sweepstakes deals on offer online! Everyone online dreams of winning free stuff. Here’s your opportunity to make it happen for yourself! 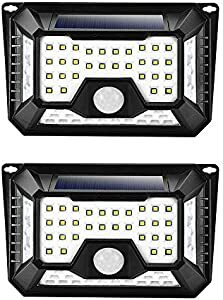 A.O.Y 4 Sides 66LED Outdoor Solar Lights 3 Modes Wireless Motion Sensor Lights IP65 Waterproof Easy-to Install Security Wall Lights for Garage, Deck, Front Door Pack of 2. According to Amazon, the odds are: 1:1700. Total winners: 2. Giveaway hosted by Amazon and Homebus. We wish you the best of luck in your sweepstakes entry. Keep checking back to improve your chances of winning!